Hiya! Welcome back to my corner of the world. In my corner of the world we all love nail polish, isn’t that right? As I mentioned in my previous post I’m doing a little mini series of some lovely polishes I picked up during the Black Friday, Small Business Saturday, and Cyber Monday weekend! 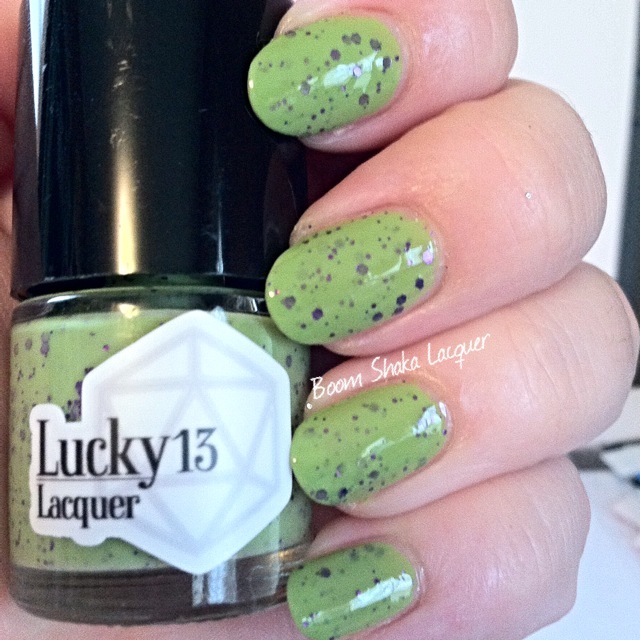 I don’t think it’s any secret but I love Lucky 13 Lacquer. Seriously, I could become addicted very easily to her polishes. Her glitter jellies are just amazing and her crellies are pretty awesome too! So today I have three beautiful crelly polishes to show you from Lucky 13 so settle in, grab a drink, and get ready for the awesomeness! First up we have Fool of a Took from her Lord of the Rings Collection! This beauty is a what I creamy green crelly base filled with small metallic purple glitters in a variety of shapes and sizes. 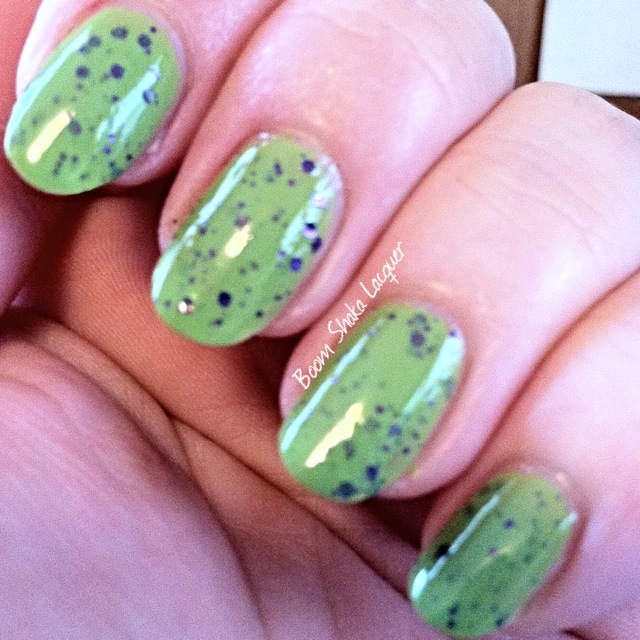 This is a great color combination and is definitely perfect for Hallowe’en manis! The formula on this was perfect. I have never been disappointed yet with a Lucky 13 crelly and this is no exception. The base is creamy and applies without any problems with application but allows the glitter to shine through. Pics show two coats plus top coat! 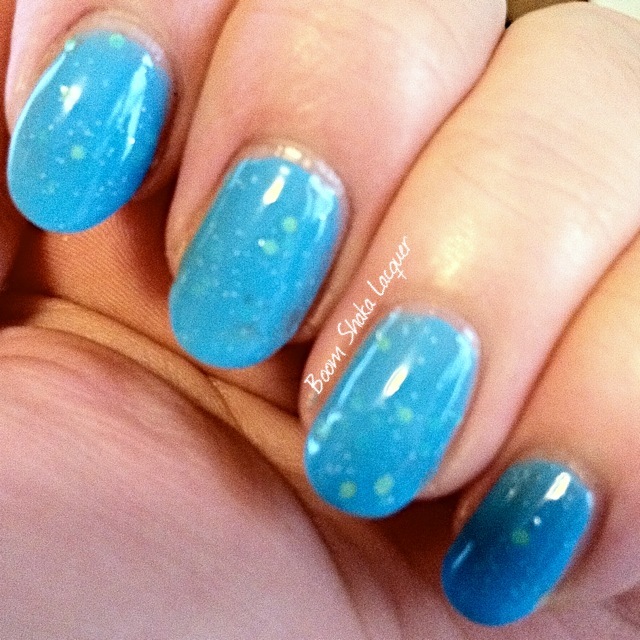 This creamy concoction is a sky blue crelly filled with metallic leaf green hexes and little silver glitters. It’s a lovely combination and while the inspiration was full of sad feels you can’t help but feel a little triumphant and happy when looking at these colors. Seriously how gorgeous is that blue? Stunning. Formula was perfection, natch! Pictures show two coats plus topcoat. One thing I noticed with all three of the lovelies that I have today is that the base is so creamy and smooth and the glitters are so well suspended that I didn’t need Glitter Food for any of them. Last but not least we have a stunning polish based on the amazing and strange River Tam (again from Firefly!). This is: No Power in the ‘Verse Can Stop Me! This color combination does scream a little more spring than winter to me, but do I care? No. Do I conform to seasonal standards when I find polishes? No. Will I show you polishes suited to whatever mood you may be having? Yes! 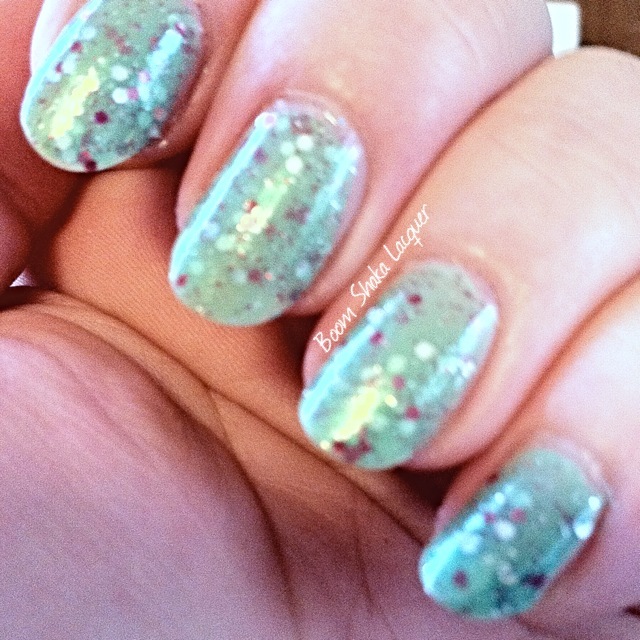 This is a lovely shimmery spring green crelly base filled with small matte white hexes and small metallic pink hexes and tiny pink and silver glitters. Totally in love with the color combination! Application was deliciously perfect and this polish went on like a dream. One thing I didn’t mention because I didn’t want to sound repetitive is that the glitter in these polishes spreads very nicely I don’t have to play hide and seek with the glitter I don’t have to do a bunch of manipulation, I paint it on and it gets where it needs to go. I love that in a polish! As always you can keep up to date on all the wonderful things going on at Lucky 13 by following her on facebook and checking out her blog! In fact she is releasing a new line based on Game of Thrones and I’m sure that I will need a few of those for my growing Lucky 13 collection! 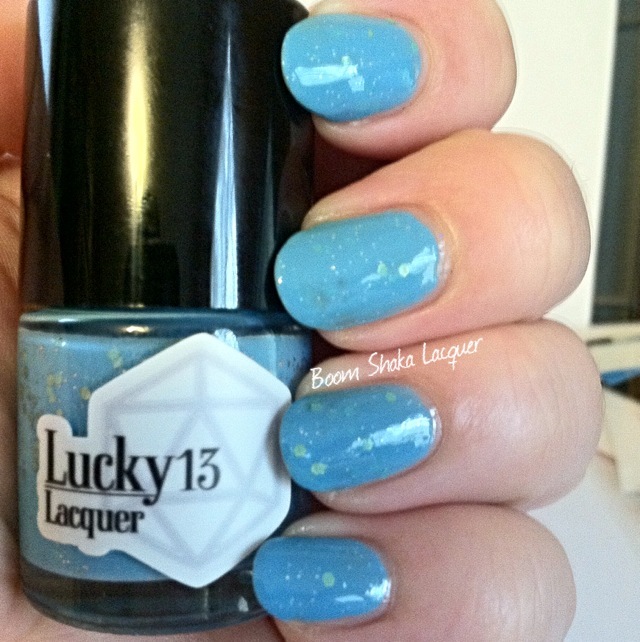 You can buy Lucky 13 polishes at her online store! Go on and get ya some! 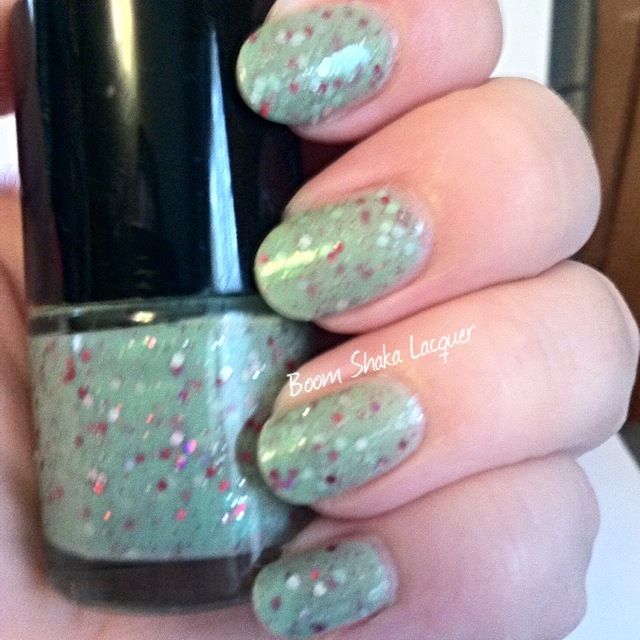 This entry was posted on January 7, 2014, in Firefly, Indie Polish, Lord of the Rings, Lucky 13 Lacquer.